In all, 34 headlines from three resources and not one of them is immediately apparent as being good news. (Gay Rights in DR Congo”?? Could go either way…) With all of this depressing and pessimistic news, it’s no wonder Americans have a skewed outlook of what’s happening on the African continent, where in more than 50 countries close to 2,000 languages are spoken. 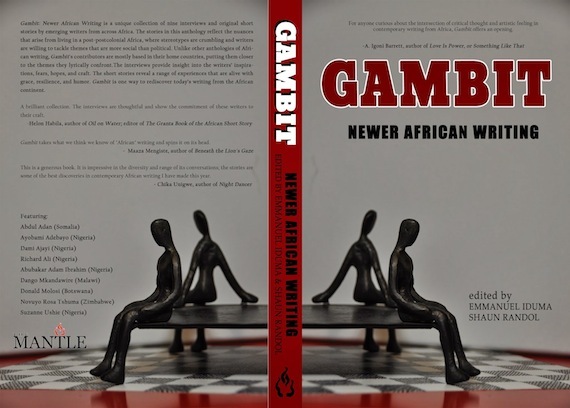 Which is why, when we published Gambit: Newer African Writing, we reached out to an artist from Burma to design the cover. As a result, the cover art depicts nothing stereotypical of “Africa” or what people would assume to be “African”—acacia trees, savannahs, impoverished children, or menacing warlords. The cover, featuring pensive silhouettes sitting above a checkerboard floor, directly reflects the mindsets of the authors within. Despite what you might read online today or see on the evening broadcast, there is good news coming from Africa. Sometimes to find that news, however, you must look beyond the headlines. Literature can be that venue. It was Czesław Miłosz and Milan Kundera to whom Americans turned when they sought news beyond the political spectacle put on by the elites in the U.S, Western Europe, and the U.S.S.R. during the Cold War. Today the same information-hungry audiences turn to the literary works of Liao Yiwu and Ilham Toti for insights into what life is really like in China. That kind of intimate observation of day-to-day living… loving… working… playing… and yes, dying is exactly what you’ll find in our book, Gambit. But my co-editor—Emmanuel Iduma (from Nigeria)—and I take it a step further: each short story in the anthology is paired with an interview with the author. Readers are exposed to the inspirations, fears, dreams, and unique life philosophies of these individuals, ten in total from Botswana, Malawi, Nigeria, Somalia, and Zimbabwe. These three women and seven men represent a rich and diverse cross-section of continental experiences. The countries featured in Gambit are as different from one another as Canada and Mexico, two very different states that happen to be on the same continent. And yet with an adjustment of a minor detail here or there, the stories could just as well take place in Toronto or Juarez. That’s because the themes are not “African;” they are human. Take, for example, Dami Ajayi’s (Nigeria) story about how smartphone technology interrupts a romantic relationship. Or Dango Mkandawire’s (Malawi) vignette on schoolyard bullying. Or the story by Donald Molosi (Botswana) featuring unrequited love between two men. Those stories do not take place under acacia trees—they take place in a 21st century globalized world. When we begin to see the countless, vexing, and poetic layers that make up Malawi or Somalia or the whole darn continent, we begin to humanize “them,” the “other” to which bad news seems to be happening to all the time, somewhere else. For if we are to live together in peace, we must first understand who and what makes up our earthly neighborhood and to understand that “Africans are just like us!” Maybe then news editors will begin to promote an alternative narrative, one not of doom and gloom but rather of art and optimism. Gambit is a humble gesture toward the betterment of our world made through informing and storytelling. Let us make an effort together to better understand each other, so that we’ll be more inclined toward cultural—not violent—engagement. Wouldn’t that be some good news?